The two pack blacking didn’t arrive and when Andy phoned the supplier he was told it was waiting on a pallet at their premises for collection. Obviously a mis-communication as Andy was expecting it to be delivered. Andy informed me the paint should now arrived before 9:00am tomorrow which will enable us to spend the entire day giving the hull a thorough final coat. Jan had a delivery. It was the carpet samples she had requested online. After looking at them and decided on the sample she wants on the floor of Waiouru Jan decided not to throw the samples in the rubbish but use them to line the base of the bed footlocker. 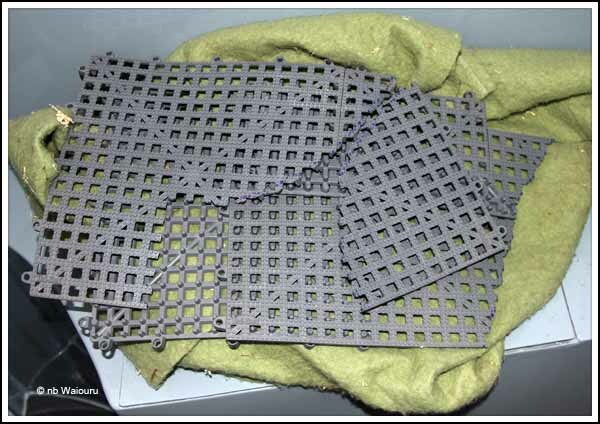 Jan had found a very good source for deck matting which we want on the rear deck. 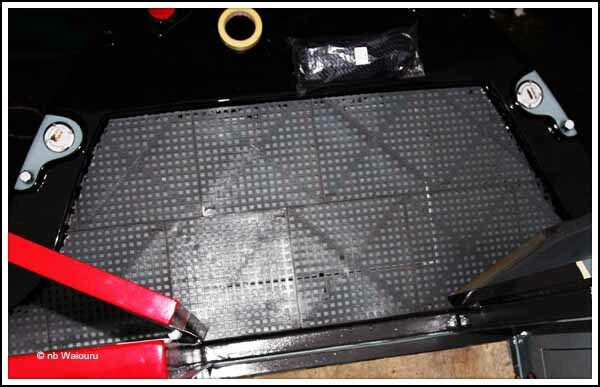 Our criteria was for non-slip with the matting raised off the deck so it can drain. She chose a grey coloured mat to go with the colour of the deck. Today I clipped the squares together, measure the area, and then cut the matting to fit the deck. I’m thinking these off-cuts will go on the floor of the gas locker which will lift the bottles off the steel and hopefully reduce the potential for rust. Yet another delivery arrived. This time it was for the roof. The Roadpro 30cm static sat-dome fits exactly on the steel mountings that were made and fitted by our shell builder (Tyler-Wilson). I suppose this should have been expected as we had seen a photo of Ben Harp with our previous dome checking it fitted on the roof. Ben told the police the dome had been stolen by persons unknown (along with our domestic battery bank, Empirbus system and cameras). The dome has been screwed to the steel mounting and the tail of the coaxial cable I had run was exactly the right length to connect to the dome <phew>. The cable entry box is under the centre of the dome and has been glued and sealed in place. The next step will probably be to drill another hole (or two) through one of the mountings so the sat-dome can be padlocked to the boat. 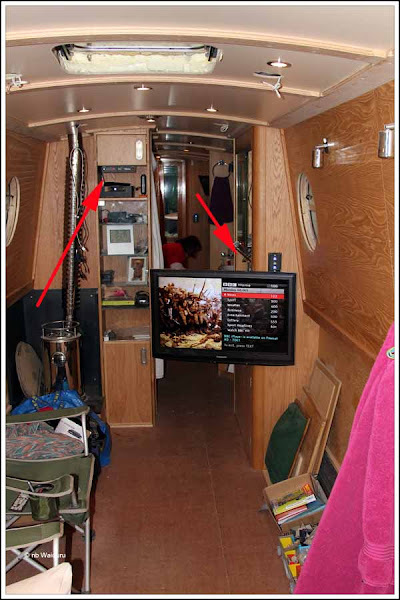 The coaxial cable inside the boat was even shorter than the end on the roof. In order to connect it to the dome controller I had to mount the controller upside down in the media cabinet. 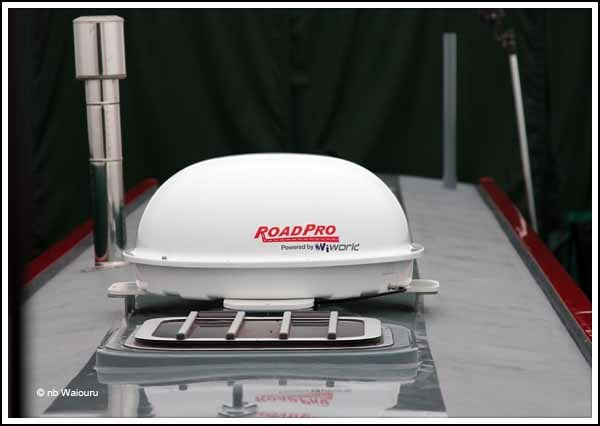 The advantage of the Roadpro sat-dome is it doesn’t require any power once the satellite has been acquired. Having installed the controller I decided to get the TV out of storage and fit on the extending arm. 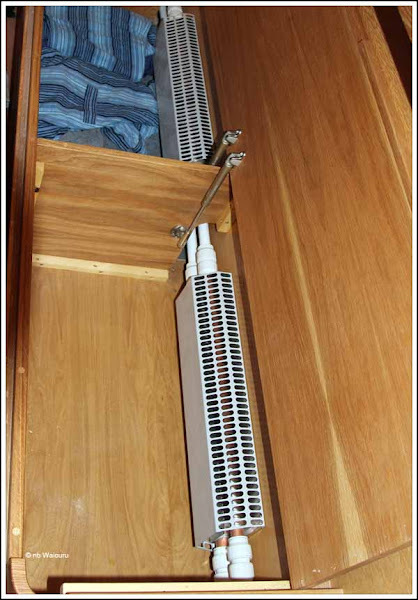 The TV swings back into the cabinet (right arrow) when not in use. It also has dual FreeView – FreeSat tuners. The TV is now tuned and using both FreeView and FreeSat. I was quite surprised that the sat-dome would work inside the tent! The only outstanding part of the media system to be tested is the HDMI connections to the Network Media Tank.